Good morning! 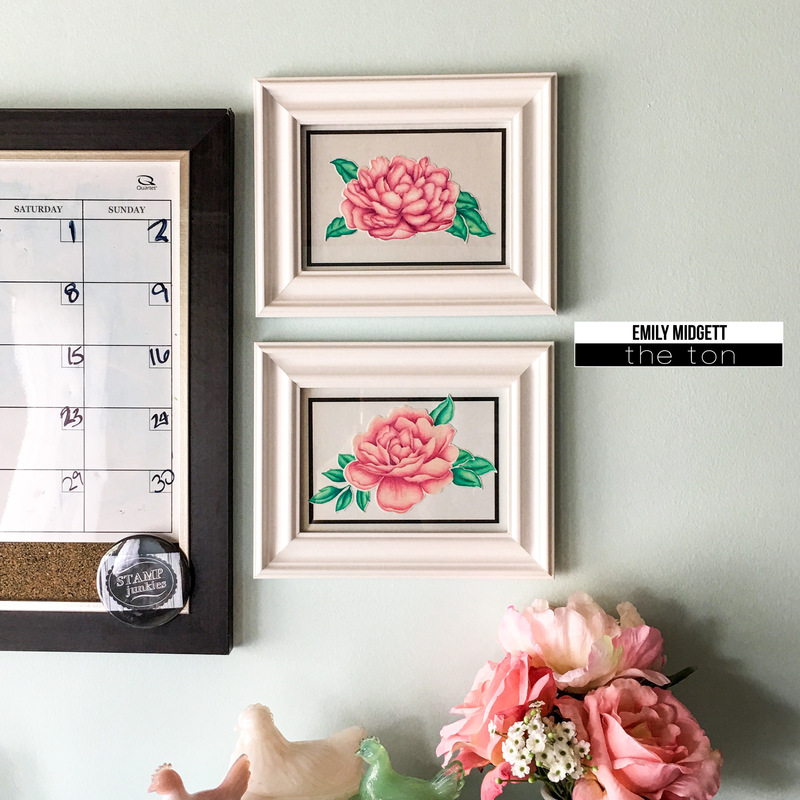 Emily here with you today on how I use my stamps from The Ton to create some lovely framed prints for my craft room. I have always wanted to have a room where I could have pink accents… My husband isn’t huge on pink (though what man is, amirite? ), so all of our common areas in our old house were to be pink-free. However, I now have a craft room all to myself, so I have been accenting the pretty aqua and white color scheme with touches of pink. Very shabby chic. I absolutely adore the shape of the new peonies (Large Peonies 4 and 5), so I wanted to use them as some artwork for my walls. Let’s get started on the details! I wanted to do some no-line coloring using my colored pencils for these projects, because my Zig markers fade far too quickly and, well, I honestly don’t have enough confidence with my Daniel Smith watercolors to try no-line watercoloring haha! I believe Prismacolors are lightfast, meaning they won’t fade (or at least not as quickly as Zigs). I started by stamping the flowers and foliage from Large Peony 4 and 5 on some Strathmore paper specifically designed for pencil coloring using some very pale gray ink. I then used my Prismacolor pencils and blender pencil to color all of the images. I then die cut each flower with their coordinating dies (Large Peony 4 dies and Large Peony 5 dies). I purchased some inexpensive 5×7 frames from my local big box store. I cut some white shimmer paper in 5×7 and 4×6, then added a 4.25×6.25 mat of black card stock to frame the edges of the peonies. Here they are mounted on the wall by my blogging calendar and my milk glass hen-on-nest collection. Don’t they look so pretty on the wall?? I think these would be a great gift idea, as well. 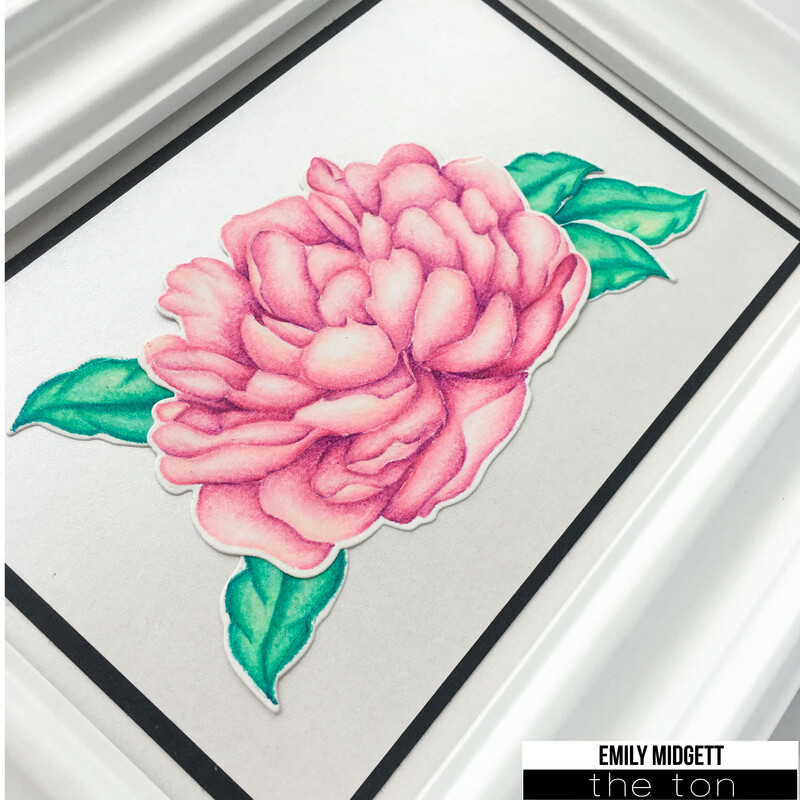 I love how generously sized the Large Peony line is from The Ton… they make beautiful cards and beautiful artwork, too! I hope I’ve inspired you to put your own stamps from The Ton to work outside of a card front! Have a marvelous day!! Your pink peonies are gorgeous. I would don the same thing it I had your talent. Love all your inspiration. I’ll keep watching you and perhaps learn by osmosis! These are GORGEOUS!! I love the no line coloring too but I’ve not done this on this type of paper, I love the Strathmore multimedia or mixed media paper but I will look for the one you used. Thank you so much for sharing these amazing works of art.